From the crème-de-la-crème of Hollywood hipsters to the bikini-clad fashionistas posing for the persistent paparazzi, the City of Angels exudes superstar appeal. Defined by 72 miles of stunning shoreline and over 90 beaches boasting miles of soft golden sands, swaying palms and a glistening ocean, the West Coast playground of Los Angeles is a sure-fire hit for surf-and-sun devotees. For the ultimate slice of seaside chic, sun-soaked Santa Monica boasts three-and-a-half miles of Californian bliss on the far northwestern edge of LA. Head to the historic Santa Monica Pier for a heady dose of sun-soaked entertainment; built in 1909 the oldest pleasure pier on the West Coast offers arcade games, food stands, an aquarium, a vintage 1920’s carousel, a rollercoaster, a plunging tower ride, street performers and the giant Pacific Wheel – the world’s first solar-powered Ferris wheel. The adjoining Santa Monica Beach runs from halfway to Malibu to almost as far as Venice Beach; this pristine stretch of powdery sand backed by the majestic Santa Monica Mountains was the setting for Baywatch and has featured in countless movies, TV shows and commercials. Rigorously patrolled by lifeguards during daylight hours, this exceptionally clean shoreline is lined with some of the city’s swankiest hotels and restaurants whilst the sands are packed out with bronzed-to-perfection rollerbladers, joggers, volleyball players, boogie boarders and sun-bleached surfers. 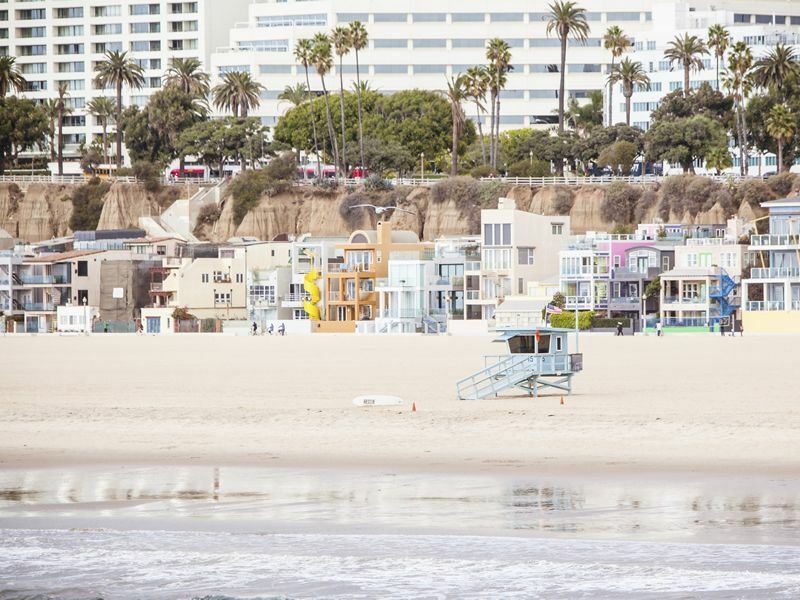 Just south of Santa Monica Beach is Venice Beach, an iconic three-mile stretch of sand filled with shaggy surfer dudes, ageing hippies, backpackers and kooky types. A must-see for any LA first-timer, this bohemian enclave is frequented by some of LA’s funkiest and freakish characters. The legendary Venice Ocean Front Walk (known as The Boardwalk) is filled with tarot-readers, tattoo artists, snake handlers, street vendors, mime artists, jugglers and break-dancers whilst the sands are perfect for people-watching, surfing and playing basketball, volleyball and handball. Visit here on Sundays to watch the Venice Beach Drum Circle, an improvised free-to-watch jam session that takes place on the sands where Brooks Avenue meets Ocean Front Walk. Originally known as ‘Venice of America’, Venice was founded in 1905 by US developer, conservationist and tobacco millionaire Abbot Kinney as a cultural hub reminiscent of Italy’s Venice. However, his vision was vetoed by the public and the area soon became a carnival-like playground for the weird and wonderful – most apparent on Muscle Beach Venice (two blocks north of Venice Boulevard on Ocean Front Walk) where rippling bodybuilders with flex their bulging muscles and pump iron to the delight of passers-by. For kid-cool beachlife near to Venice Beach, descend upon the sands at Marina del Rey. Home to Marina Beach – nicknamed ‘Mother’s Beach’ as it is a firm favourite with LA mums – this child-friendly beach at the corner of Admiralty Way and Via Marina has a protected 12-acre lagoon, barbecue pits, sheltered picnic tables, a playground and a manned lifeguard tower. Located north of Santa Monica is star-studded Malibu, home to some of LA’s most fabled beaches. Boasting 21 miles of coastline, this celebrity-filled community is home to Zuma Beach, a fabulous long stretch of sugar-white sand backed by waters that boast the best surf breaks in Southern California. Pack a picnic or refuel at the snack bar, play volleyball on the public courts, share sand space with A-listers and watch Californian grey whales migrating between late-December and March. Another great Malibu gem is Leo Carrillo State Park, named for the US actor and conservationist who served on the California Beach and Parks Commission for 18 years. Located at Malibu’s western end, this one-and-a-half mile beach is dotted with coastal caves, reefs and tide pools and boasts a large tree-lined campsite. For further beach action, South Bay’s hip Manhattan Beach is a two-mile stretch of beachfront located at the southerly end of Santa Monica Bay. This Californian classic is known as the world capital of beach volleyball and hosts the annual Manhattan Beach Open tournament – nicknamed the Wimbledon of Beach Volleyball. The Pacific waters are perfect for year-round fishing, swimming, surfing and boogie boarding and there is also a children’s play area and a paved beach-front path for cyclists. Escape the heat by taking a stroll to the octagonal-shaped Roundhouse Marine Studies Lab and Aquarium at the end of the historic 928-feet-long Manhattan Beach Pier; this free-to-enter research centre is filled with ocean creatures such as baby sharks, lobsters and brightly-coloured fish. Another sandy South Bay fixture is Hermosa Beach, located south of Manhattan Beach. Alluring with a one-and-a-half mile expanse of sand, this is paradise for sun-worshippers, swimmers, skateboarders, boogey boarders and volleyball players. Dine at the al fresco restaurants, bars and cafés on The Strand, the paved boardwalk that borders the beach, and book tickets to the Comedy and Magic Club, a nightly showcase of the world’s hottest stand-up comedians. Most famous for surfing, this beachside community honours the sport with the Surfer’s Walk of Fame and holds an annual induction ceremony when the recipient’s name is engraved on a plaque that is embedded in the Hermosa Beach Pier. Also popular here is Shakespeare by the Sea where a non-profit organisation creates theatrical experiences and promotes literacy by performing free-to-watch Shakespeare plays on the pier during the summer. Beyond getting animated with Minnie and Mickey, enjoying adrenalin-pumping rides at Universal Studios, strolling down the Hollywood Walk of Fame and counting bricks at LEGOland, LA offers plenty of pursuits off the beaten track. Experience the real taste of LA at Pink’s, a much-hyped landmark that has been serving up highly-acclaimed chili hot dogs since 1939. Its history reads like a Hollywood love story; married couple Paul and Betty Pink sold dogs from a cart on a street corner at La Brea and Melrose in 1939 – and the locals fell in love with them. There are over 30 types of hot dogs and hamburgers available; the portions are huge, the prices affordable and the recipe for Betty’s original chilli formula is still a much-guarded secret. Expect to spot a celebrity as you wait in line. Info: 709 N La Brea Avenue. Chili hot dogs cost around £2 each. Shop on Montana Avenue, the charming tree-lined Santa Monica retail neighbourhood located 21km from the heart of Downtown LA that spreads over ten blocks between 17th and 7th Streets. This is one of the Westside’s most chichi shopping hubs and home to 150 sumptuous one-off speciality shops and boutiques selling apparel, jewellery, make-up, footwear, home furnishings, gifts and more. Highlights include Aura Boutique for vintage glamour pieces and cocktail dresses (1528 Montana Avenue), Shabby Chic for home decor (1013 Montana Avenue) and Every Picture Tells A Story for a huge range of kids’ books (1311 Montana Avenue). LA’s Getty Museum, also known as the Getty Centre, occupies 750 acres of land on a hilltop overlooking the Santa Monica Mountains and the Pacific Ocean. Named for oil millionaire and avid art collector J. Paul Getty, this sprawling complex was designed by US architect Richard Meier in 1997 at a cost of $1.3 billion and includes four exhibit pavilions and an enchanting 134,000 square-foot landscaped Central Garden. Art lovers can marvel at classical sculptures, illuminated manuscripts, European and American photography and an extensive collection of ancient Greek and Roman treasures. Most alluring are Irises by Van Gogh, Portrait of a Halberdier by Pontormo, and a copy of Portrait of Louis XIV by the workshop of Baroque artist Hyacinthe Rigaud. Info: Admission is free; 1200 Getty Centre Drive. Pack a picnic and watch a rehearsal at the Hollywood Bowl, the city’s huge amphitheatre set in the Hollywood Hills. With an 18,000-person capacity, this unique outdoor venue is home to the Hollywood Bowl Orchestra and hosts the Los Angeles Philharmonic during the summer. Whilst it’s traditional for LA residents to pay to watch the very best jazz, classical, Broadway and world music performances, it is not widely advertised that some rehearsals are open to the public and are completely free. Head here on Tuesdays and Thursday mornings between 9.30am and noon to watch the Los Angles Philharmonic orchestra rehearse – and take time to explore the free Hollywood Bowl Museum. Info: 2301 North Highland Avenue; rehearsal schedules times vary. Pay your respects at the Hollywood Forever Cemetery on Santa Monica Boulevard in the heart of Hollywood. Founded in 1899, the cemetery has long-been the cemetery of choice for hundreds of Hollywood studio moguls, screenwriters, actors and directors. Listed on the National Register of Historic Sites, you can hang out at the gravesides of Hollywood’s elite including Ramone, Rudolph Valentino, Cecil B. DeMille, Jayne Mansfield, Tyrone Power, Edward G. Robinson, Douglas Fairbanks, Charlie Chaplin Junior, and Mel Blanc, the voice of Bugs Bunny. There are even movie screenings here in the summer on the grounds amidst the headstones. Morbid but mesmerising. Info: Admission is free but movie screenings tickets cost £6.50. Trendsetters should check in at the retro-chic Hotel Erwin, a boutique property that reflects Venice Beach’s eclectic vibe. Located just 200-feet from the sand, this stylish retreat greets discerning guests with a huge graffiti mural splashed across the hotel’s entrance and lots of street-art-inspired décor. Drink in the rooftop lounge High and dine at Barlo, the hotels ground-floor restaurant that serves great home-style breakfasts and American bistro-style dinners. Star-spotters will love Chateau Marmont, a fantastical 1920’s folly built to resemble the Loire Valley’s Chateau Amboise. It was here where Bogart bedded Bacall, James Dean hopped in through a window to audition for Rebel Without A Cause and Jim Belushi died of a heroin overdose in Bungalow #3. Celebrity hotelier André Balazs acquired the fading estate in 1990 and restored it to the glory of its Hollywood heyday. This turreted white castle boasts 63 individually-designed rooms including suites, bungalows and cottages. Highlights include the saloon-style Marmont Bar and the oval-shaped pool. The design-conscious will adore Shade Hotel, Manhattan Beach’s only luxury boutique hotel located two blocks from the oceanfront. This upscale costal retreat is all about interior design; each of the 38 guestrooms is outfitted with state-of-the-art coloured mood-lighting and cutting-edge monochrome styling – some rooms have two-person hydrotherapy spa tubs and private balconies. Book a pampering treatment, chill out by the dipping whirlpool pool at the rooftop Skydeck bar and mingle with the beautiful people in the Zinc Lounge, a hip LA spot complete with a DJ and extensive cocktail menu. Further reading: There really is something for everyone in LA. Whether you’re looking for entertainment, culture, nature or simply some good shopping, Los Angeles will suit you out. Not convinced? Take a look at our top 10 things to do in Los Angeles.